← Syrian Civil War: Freedom? Or Something Else? The American left has a penchant for rewriting history, and playing word games to suit their agenda. The most commonly used example is the word “liberal” itself. The left has been referring to themselves as “liberal” since FDR’s reign. What is ironic about this, is that the left is actually the antithesis of the true meaning of liberalism, which can be summed up as a political ideology in which primary emphasis is placed on securing the freedom of the individual by limiting the power of the government. It advocates civil liberties, limited government under the rule of law, private property rights, and belief in laissez-faire capitalism. After all, the word “liberal” is rooted in the word “liberty”, which is as American as apple pie, baseball, and Smith & Wesson. Limited government? Civil liberties? Laissez-faire capitalism? I know, I know…it doesn’t sound like the American left of today. Leftists typically desire big, expensive, controlling government, limited individual liberties, limited private property ownership, and government-infused (crony) capitalism. They just love to tax, legislate, and regulate us to death. There is nothing truly liberal about NSA spying, prosperity-killing progressive income taxes, foreign drone wars, gun control, etc. So then why did the left adopt the term “liberal”? It was merely a head-fake; an attempt to “re-brand” itself. Think about it: would you vote for someone who described themselves as socialist, or tyrannical? Of course not. Hence, they describe themselves with a hijacked word that most Americans think of in a positive light. After all, what patriotic American isn’t pro-liberty? They’re hoping that you won’t look into their policies and beliefs, and that you’ll just take their word for it; that they’re liberty lovers. It’s kind of like taking a junk vehicle, calling it “Quick and Reliable”, and hoping that you will buy it based on name alone, without test driving it. For the cleverly deceptive progressives, hijacking positive terms for their own political gain isn’t enough. They’ve also gotten very good at spinning negative words and ideas as “right-wing”, and pinning them on their opposition, regardless of the accuracy of their claims. Take the “racism” charge for example. I personally have been called a racist simply because I do not agree with the socialist policies of Barry Soetero. Regardless of how incredible these claims may sound, progressives will continue to make them because they simply cannot argue the facts. Historically, the facts are clearly stacked up against them, especially very damaging truths, such as that leftists killed more people in the 20th century than the number of dead from combat in WWI and II. These are the truths that the left simply refuses to acknowledge. I equate this to trying to prove to someone that their religion is false. Indeed, the left does treat their political ideology as a religion. Even when presented with clear and concise factual objections that completely dispel their beliefs, they still refuse to acknowledge the painfully obvious, and generally project these difficult truths back onto their opposition. Maybe it’s because they’ve devoted so much of themselves to their “religion”, that they wouldn’t know what to do with out. And such is the case with Adolf Hitler, Nazism, and fascism. Considering how damaging it would be to have these concepts aligned to your own politics, the left has worked tirelessly to distance themselves from the fact that Hitler, Nazism, and fascism were all left-wing. Hitler, fascism, and the Nazis have been quite successfully marketed as “right-wing” by leftist historians and mainstream media, in complete spite of the facts. Many people (myself included) grew up believing that Hitler, the Nazis, and fascism were products of “right-wing extremism”. After all, Hitler WAS against communism, right? And he allowed for the existence of private corporations, right? So then he must be a right-winger…or so they say. The simplest way to define the Nazis is by eo nomine, which is a Latin legal term meaning “by name”. Many people don’t even know what “Nazi” stands for, and I think there is a particular reason for that. And the reason is that the name itself refutes the very idea that the Nazis were “right-wing”. “Nazi” is short for National Socialist German Workers’ Party (NSADP). It would be difficult for progressives to espouse the idea that Hitler/Nazis were anything but leftists/socialists if they used the proper party name. “But what about the “National” part?” they ask. Surely, that is right-wing! Right…? Patriotism is reserved for right-wingers and republicans, right? Wrong. The “national” aspect of the Nazi ideology could be summed up as the scope of the party. (A national scope) You see, most Marxists and communists view the world with open borders. They have little respect for national sovereignty, and actually desire central, global governance. (Like the United Nations) Unlike the commies, Hitler and the Nazis strongly desired a sovereign nation. They had a lot of pride for their country. Hitler capitalized on the fact that Germany lost most of its sovereignty after they lost WWI, and had the Weimar Republic installed. If you know your history, you would know that the Weimar Republic ended very badly. As a testament to the evils of central banking and fiat money, (::cough:: Federal Reserve ::cough::), it should be noted that after the Western-backed Weimar Republic began printing more and more money to pay back its debts from the war, their money was devalued incredibly. Most Germans, who had worked their whole lives to save money, found their money now worthless. They were poor, tired, and frustrated. It took a wheelbarrow full of money just to buy a loaf of bread. This helped set the stage for Hitler’s national socialist agenda. He placed the blame squarely on international capitalists; especially the Jews. His successful creation of class and racial warfare was what he needed to catapult the Nazis to power on a nationalist (Germany first) platform. 7. We demand that THE STATE be charged with providing the opportunity for a livelihood and way of life for the citizens. 13. We demand the nationalization of all associated industries. 25. For the execution of this we demand the formation of a STRONG CENTRAL POWER in the Reich. Next, I’m going to break down how National Socialism was the antithesis of libertarian principles, as well as some commonalities between National Socialism and today’s progressive / democrat / liberal / socialist left. Free Markets – – Some leftists like to say that Hitler was pro-free markets because he still allowed private ownership of companies. This is only partially true. The Reich “allowed” you to run a business if, and only if, you were favored by the Party, and operated in accordance with their desires. Hitler’s crony capitalism was basically a “pay to play” system. You had to appease the Reich before you could run a business. This should sound familiar to Americans. Obama has a similar “pay to play” system. A great example would be the “green” c0mpanies, like Solyndra, that received government loans to the tune of billions of dollars. Most of these companies were huge funders of the Obama campaign, and other progressive causes. The American left in general hasn’t been very friendly towards free markets either. Our current economic crisis can easily be tied back to progressive Woodrow Wilson. He created the privately-owned, central banking cartel known as the Federal Reserve, in 1913. He also signed the Revenue Act of 1913, which created the progressive income tax. Another fine example of economic tyranny by the left is FDR’s Executive Order 6102, which allowed the government to steal all of the gold owned by private citizens. Individual Liberty – – You’d have to be insane to believe that Hitler was pro-liberty. As Chancellor, one of the first things he did after the Nazis won a super-majority of the parliament, was to suspend Germany’s constitution. He imprisoned and/or executed people based solely on race alone. During WWII, this concept was not confined to Germany and the USSR. FDR also imprisoned over 100,000 Americans based solely on race. Under FDR’s Executive Order 9066, the American government essentially suspended the Constitution for Americans of Japanese descent. They were imprisoned without charge or cause. A liberal-majority Supreme Court upheld the decision in Korematsu v US, in one of the worst decisions the high court ever made. Personal Responsibility – – Point 7 of the 25 Points of the NSDAP completely absolves the individual of responsibility for himself. It charges that the State provide individuals with sustenance. This is not very different from our current welfare state in America. Besides Social Security, created by FDR’s “New Deal”, LBJ greatly expanded the welfare state with his “Great Society”. We now spend more on entitlements than we do on defense of our nation. Limited, Constitutional Government – – As noted above, Hitler suspended Germany’s constitution. He also vastly expanded the size of government. The Reich reached into nearly every part of German life. People were kidnapped and executed by the German government, without charge or cause. This is not much different, in theory, than our very own National Defense Authorization Act (NDAA), which allows the government to arrest and indefinitely imprison individuals without being charged, without having access to a lawyer, and in complete subversion of the US justice system. Our current American government is also expanding at a rapid state. A recent notable unconstitutional expansion of government was the creation of the TSA, under progressive RINO George W. Bush. Most progressives view the Constitution as a “living” document, and that its meanings change with the times. These leftists view the Constitution as merely a roadblock to their socialist utopia, where the ends justify the means. 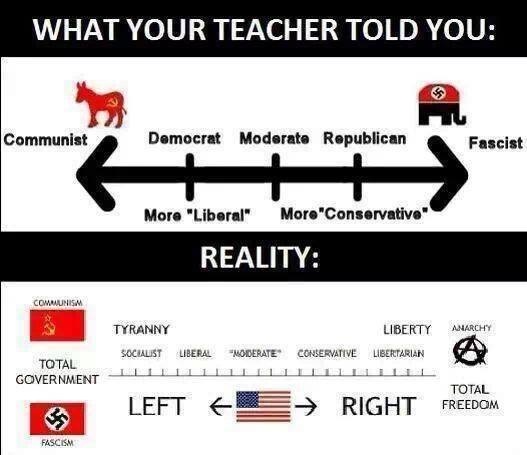 According to progressives, the political left is communism, and the political right is fascism. Don’t let them get away with these lies. If a leftist spouts this crap, ask them where anarchy falls on the spectrum. Because a legitimate political spectrum, from left to right, is based on the size/scope of government, as well as the balance between collectivism vs. individualism. The left equates to total collective government, whereas the right equates to no government (anarchy). In reality, fascism is just another brand of tyranny and totalitarianism; a “cousin” of communism. The progressives place fascism on the right side of the spectrum as a scare tactic to prevent people from moving to the right politically. They want to create the illusion that both sides of the spectrum end in totalitarian government, and that liberalism is the “centrist”, or “moderate” choice. The true “center” is conservatism/libertarianism. To the left – – big government. To the right – – anarchy. In reality, the LEFT has always been the home of tyranny. They conceal the fact that the farther right you move, the more freedom the individual has. By principle alone, a right-wing tyrannical government cannot exist. That would be a logical fallacy. Because once a government shies away from individual freedom, and small, constitutional government, it ceases to be a “right-wing”/libertarian government. The bigger and more powerful a government gets, the further left it slides on the scale. Don’t fall for their false “choice” of big government or fascism. Fascism is just a cousin of communism. Choose liberty. As a side note, I’d like to share with you what I learned while typing this. My intention with this article was to expose the distortion of history and specific words by progressives, with the main point being the false assertion that Hitler and the Nazis were anything other than left-wing lunatics. But while doing this, I also began to realize something else. Not only was Hitler a leftist, but his policies are beginning to very closely resemble those of our current administration… I always wondered how the German people allowed those atrocities to happen. I guess now I know…. They, too, fell for the “hope and change” rhetoric. Very well written and researched. I thoroughly enjoyed reading this article. Keep then coming my friend! !